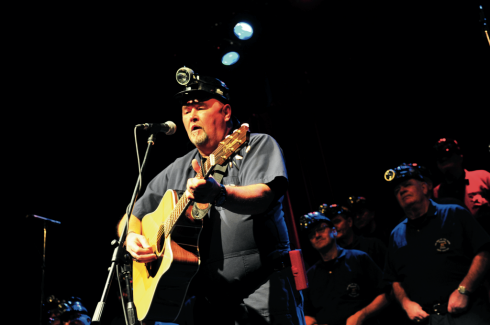 Plan to enjoy a Men of the Deeps concert this summer at the Cape Breton Miners Museum. The Men of the Deeps is a choir of working and retired coal miners from Cape Breton Island. Organized in 1966 as part of Cape Breton’s contribution to Canada’s Centennial Year (1967), the group’s inception was an effort by the people of Cape Breton to preserve in song some of the rich folklore of Cape Breton’s coal mining communities. To belong to the singing group a man must have worked in the mine. The ages of the men range from the mid-thirties to the upper-seventies, about one-quarter of which have been with the group since it was organized in 1966. A special sense of authenticity is given to the group by the presence of several retired coal miners who recall vividly the days when coal miners were looked upon as “second class” citizens, forced to eke out a living mining coal in hazardous conditions while their lives were almost entirely dependent upon the company. Today the Men of the Deeps are more than a singing group -it is a social institution. There is a comaraderie amongst the members of the group that carries over to their audiences wherever they perform. Clad in coveralls and hard hats, they make an impressive impact when they enter a concert hall in total darkness with only the lamps on their helmets for light.